Today we trialled an easy straightforward dessert, Apricot Sour Cream Pie. The hardest part about this dish was taking the photos! You see, we live in an apartment which is in the shade for most of the day. In fact, it's so dark that while in the car I have to squint. It is a shock to see that it can be bright outside! So you see working in a darkened room would be a challenge. And mental note to self: "Go outside more". 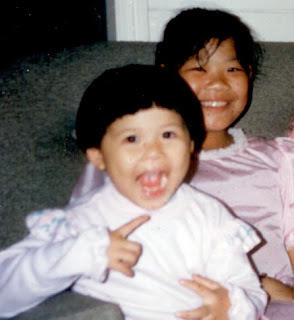 The photo taking process was laborious. We spent several hours, getting increasingly hot and frustrated, playing around with reflectors (i.e. foil), artificial lighting (i.e. one lonely reading lamp with baking paper wrapped around it), and backgrounds (i.e. white pieces of material). Each shot, we improved on the image but golly gosh it was hard work. Why? Because we are newbs. It really boils down to that. We took a photo of how all the props were placed. Position of lamp in relation to picture on wall. Check. State of scrunched up baking paper. Check. Where Mabel stands with said lighting in relation to corner of bed and chair. Check. Wait up...isn't this all going to change depending on the time of day, and amount of light filtering in? Oh Nooooooooooo. I foresee many more hours spent tilting, straightening, checking and shining. I found it fun nevertheless. But that goes without saying, since Mary did do most of the hard work, hehehe. The joys of being the big sister! We couldn't wait to eat the pie! 1. For the base, crush biscuits finely. I placed the biscuits inside a freezer bag, and smashed it with the end of a rolling pin. Beware of holes in bag. 2. Combine crushed biscuits with the melted butter. You know you have enough butter when the mixture does not crumble when you squeeze it together in your hands. Don't worry about the fat content. Take the pie to work, distribute to your neighbours. That's what I do. 3. Press biscuit mixture into a springform pan. Try to press some of the mixture up the sides of the pan. 4. Put into fridge, while preparing the filling, which now follows. 5. Combine the drained chopped apricots and 3 tablespoons of sugar in a saucepan. Stir until sugar is dissolved. 6. Now it's time to thicken the apricots with the flour and water mixture. Blend flour and water first in a separate bowl. Pour into saucepan slowly and stir vigorously to avoid lumps. Take off the heat and cool. 7. 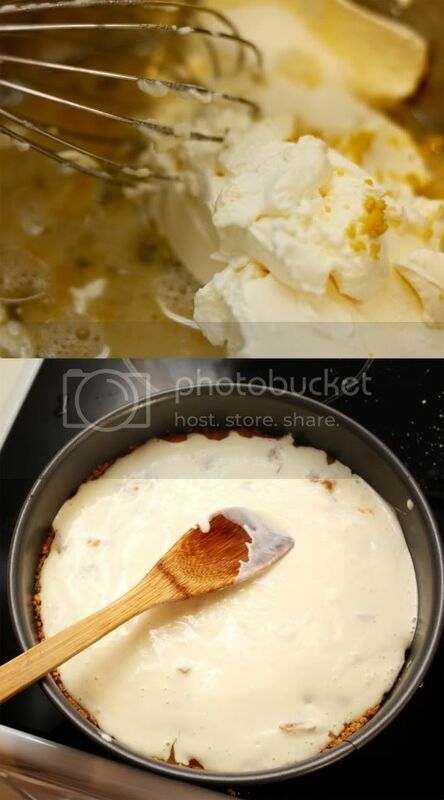 Meanwhile combine the sour cream, egg, lemon rind and 1 tablespoon sugar in a separate bowl. 8. Now onto assembly. 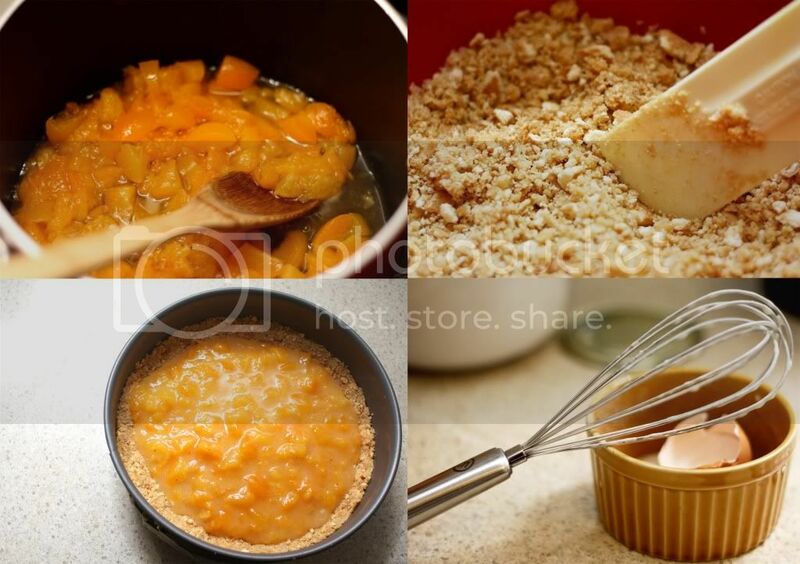 Spread apricot mixture over biscuit crumb crust. Bake in a 180°C oven for 10 minutes. 9. 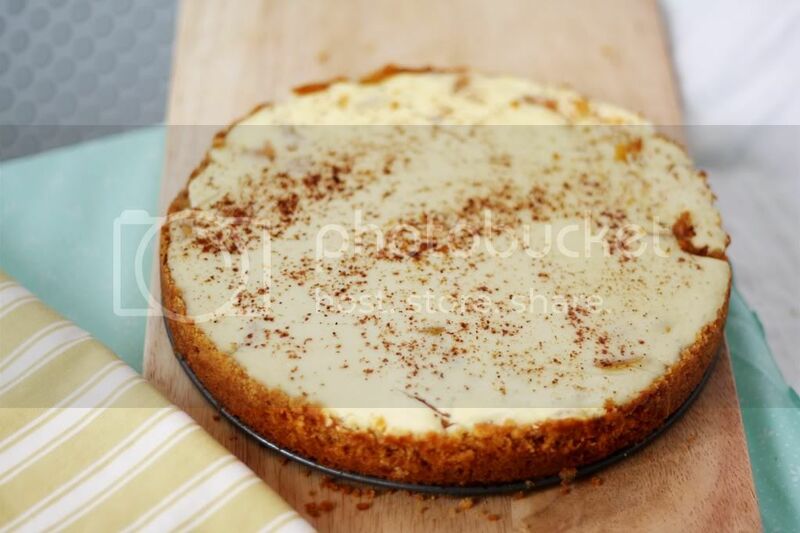 Then, take it out of the oven, spread the sour cream mixture on top of the apricots, sprinkle some nutmeg on top and bake for another 20 minutes, or until the cream has set. Ours was wobbly in the centre when you shook it but had actually thickened enough to cut. That's it. Enjoy. How original! Looks delicious though. And the labor was well worth the effort...beautiful pics! I'm an apricot lover and I can see this recipe will take time and will be a bit messy but as I said, apricot will definitely indulged me into making one of these. Thanks. Hi Darcy - Thank you. 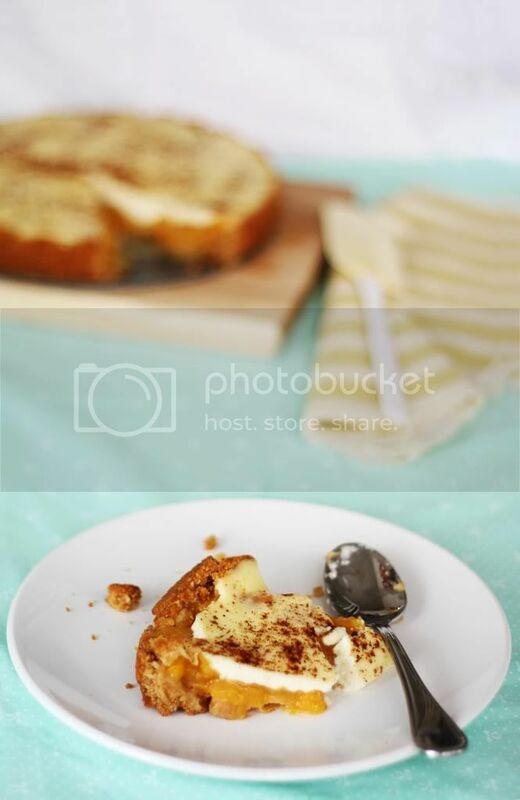 :) From taking the photos, cooking and styling, and writing the post, many hours had elapsed. Neither of us realised how time consuming it was. 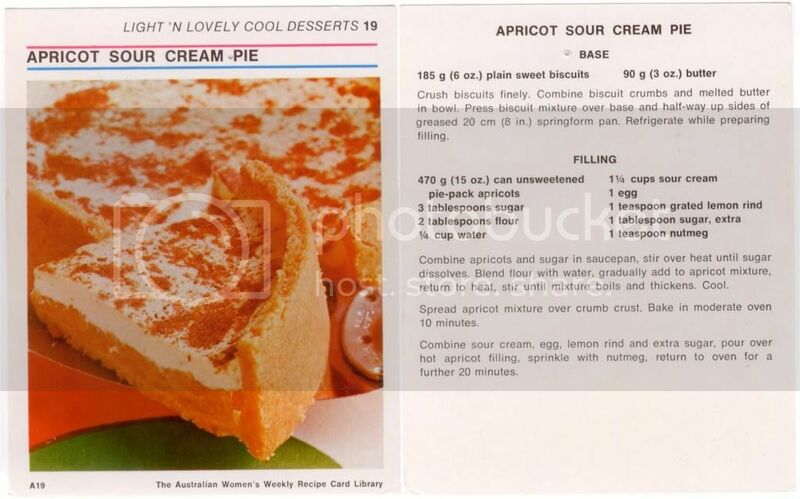 Hi Brad - You should definitely make this pie, apricot goes really well with the sour cream. Thanks for stopping by! Not a big fan of apricot, but I have to say that this dish looks tempting in a creamy, crumbly way. Also, you go to HEAPS more effort with your photos than I do! And I think it shows, lol. Vintage phones, suitcases and books are cool. What about vintage food? Join us as we test our cooking skills and stomachs as we selectively cook our way through the Australian Women's Weekly recipe box. Some of the recipes truly are strange...dare we say awwful? Let us know if you try any of the recipes! Here's a photo of us. Mabel's all dressed up to go to a fancy dress ball. And Mary is being a 3 year old.